Like with people inner beauty is more important than the outside but that does not mean that outside looks are not of any importance at all. It is the same with your kitchen as well. In our last blog post we discussed the different kinds of material that you can use to make your kitchen. In this post we will be covering the various finishes that you can use for your kitchen shutters and what are the pros and cons of each. We will cover what is the material that each finish is made of, what it their durability and the variety of colours and finishes in each briefly as well. The shutter finishes that we will be covering today are laminates, UV finish, Acrylic sheets, Lacquer paint, and Veneer finish. The durability and compatibility with the Indian kitchen will be discussed for each finish. So lets begin the earth for the perfect finish for your kitchen. This is a 1mm thick mica sheet that is fabricated in different different colours and finishes. This is then pressed on the material of your choice. This is where we can mention the first advantage of this finish. They are easy to use since they can can be pressed over different kinds of boards and not just one with absolute smooth surfaces like MDF/HDF. These shutters generally have the most variety to offer, in terms of finishes as well as colours. Their finishes wary from matt, to emboss to gloss. This material is scratch resistant and very versatile in its looks. 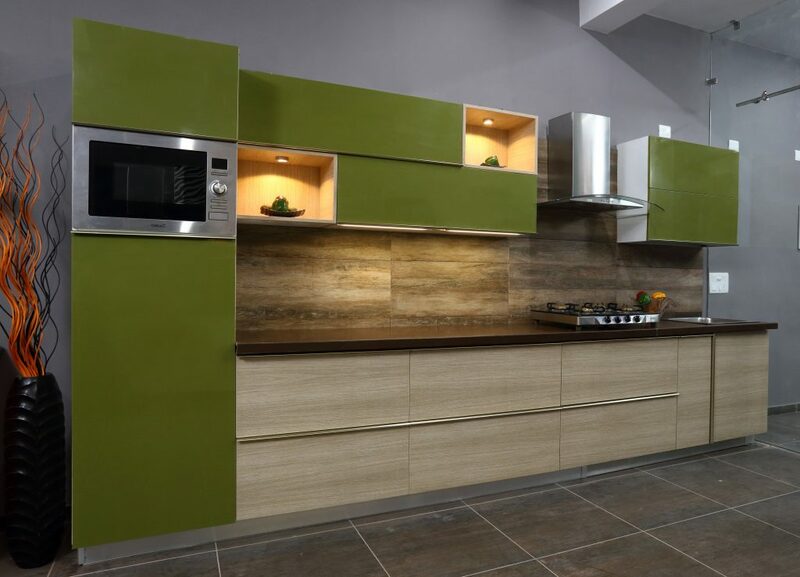 This is a very durable finish, that is well suited to be used in kitchens and interiors. Most branded laminates are scratch resistance and handle rough usage of furniture well. The pros of this finish is that they are easy to clean, generally do not loose colour over a long period, easy to maintain and last but not least easy to use. Oh and I forgot to mention one of the best pros. They are the most affordable as compared to the other finishes that we will be talking about further. The second finish we will talk about are UV shutters. This finish is made by painting huge boards and then coating them with UV protection. This achieves the purpose of increasing the durability of the finish as well as gives it a glossy finish. Depending on the brand of UV shutters that you will choose the quality of gloss will vary but generally it is better than that of the gloss laminate finish. They are great to be used in either kitchens or other interior spaces especially in combination with matt finishes. These are 1mm sheets that are pasted on MDF/HDF boards. Their quality is different than that of the other gloss shutters in the form of its reflection. Their reflection is mirror like. Both Indian and other countries manufacture it as well. The German manufactured ones are that of the best quality. A good quality acrylic panel has high scratch resistance, stain resistance and maintains its colour and finish for at least eight years. They work well in almost all parts of the home, from LCD panels, kitchens to sometimes even doors. They are more durable and scratch resistance as compared to UV boards. They are also available in ultra matt finish, which provide a bold look and durable quality . One of the only draw backs of this material is that it is a little expensive as compared to other finishes and that it comes in limited colours. It is basically a 0.3 mm thick sheet that has been pasted on top of an MDF or HDF board. Since the sheet is almost like a sticker it can give a great finish to grooved shutters. It gives the shutter an edgeless finish. The colour and shades are available in limited colours. The other disadvantage is that they are not heat resistance. This leads to the sheet coming off from the board in two to three years. Like laminate shutters there is a wide variety of paint finishes, we recommend the one with high level of coating and proper buffing for good gloss factor. These shutters have seamless edges. All the other shutters generally have edge lines. This gives a sleek and high end look to the shutters. Most high end international furniture and kitchen brands use this finish extensively. Variety in this case is your imagination. If done well this product is durable, though slightly less scratch resistance as compared to acrylic boards. These are real wood skins used in various types of polish to bring out a truly rich and elegant look. Actual sheets of wood bark are pasted on MDF or HDF boards. They polish is used to lock in the look of the wood and bring out the natural grains of the wood. There are many different colours that can be made in this finish by coating the panel with different colours and polishes. This is generally expensive and durable, can be used in all parts of the interiors as well. They also have seamless edges and have a great feel to it. The only disadvantage of this finish is that it is a little difficult to clean since dust can get stuck in the veins.